TX-20 is a Minifigure based upon the Tactical Droid of the same name in the Star Wars Universe. 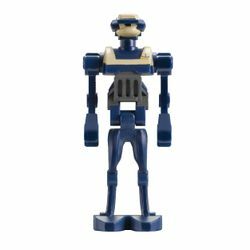 The Tactical Droid has dark blue arms and legs, and parts of his head-body (one piece) are also dark blue. Its legs are identical to the Super Battle Droids, except for colour, and the same applies to the arms, except that they are the same as regular Battle Droids, not the superior variant. Its body is dark grey in the middle, blue at the top and bottom, and beige at the shoulders and along a strip at the front. The Tactical Droid's neck is dark blue, and its head is part beige and part dark blue. In LEGO Star Wars III: The Clone Wars, TX-20 is an unlockable character with the ability to shoot and command squads of Battle Droids and Super Battle Droids. It has the abilities to jump, and also to gain access to items that can only be unlocked by the Tactical Droid. TX-20 was a tactical droid stationed on the Ryloth city of Nabat during the Clone Wars. A strategic planner like all tactical droids, he used the Twi'lek prisoners there as a living shield to prevent the Republic from taking the city. Those same prisoners tore TX-20 apart after they were freed by Obi-Wan Kenobi, who along with Boil and Waxer used a covering assault by Commander Cody to evade the droid's attention. 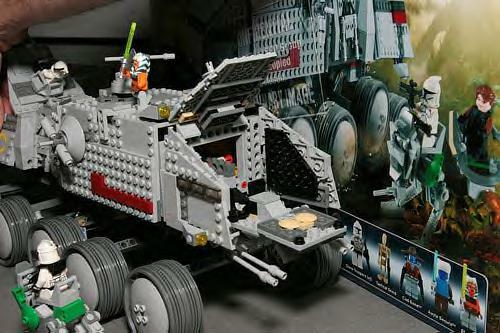 According to preliminary box art, this Minifigure was originally scheduled to appear in the 8098 Clone Turbo Tank, but the figure was not inserted into the final version of this exact set. The head/body is a brand-new piece, designed for this new minifigure only. The head can be removed and put on a character in LEGO Star Wars III: The Clone Wars for access to the Separatist Droid panels. Interestingly, TX-20 was deactivated before Mace Windu appeared on Ryloth, despite being in the same set.